Go camping in Sisters Country! Season: Year-round (weather permitting). Location: On Metolius River, 5 miles north of Camp Sherman Store. Access: From Sisters, 9.6 miles northwest on Hwy. 20, then 11.1 miles north on Road 14. Elevation: 2,700 feet. Facilities: Vault and wheelchair-friendly toilets, tables and grills. Sites: 9 tent, 6 combined (tent or RV). Average parking apron size: 11x35 feet. Special Activities: Catch-and-release fishing, trails. Rates: $16 per day ($12, mid-October to late-April). Reservations: None. Details: www.hoodoo.com. Season: May-September (weather permitting). Location: On Metolius River, one mile north of Camp Sherman Store. Access: From Sisters, 9.6 miles northwest on Hwy. 20, then 6.1 miles north on Road 14, then one mile north on 1419. Elevation: 2,900 feet. Facilities: Vault toilets, piped drinking water, tables and grills. Sites: 10 combined (tent or RV). Special Activities: Catch-and-release fishing, trails. Rates: $16 per day. Maximum 14-day stay. Reservations: None. Details: www.hoodoo.com. Season: May-September (weather permitting). Location: Last campground on the Metolius River in Camp Sherman. Access: From Sisters, 12.4 miles northwest on Hwy. 20, then 12.3 miles north on F.S. Road 12, and then 1.6 miles east on F.S. Road 1200-980. Elevation: 2,700 feet. Facilities: Vault toilets, tables and grills. Sites: 10 combined (tent or RV). Average parking apron size: 20x28 feet. Special Activities: Catch-and-release fishing, trails. Rates: $12 per day. Maximum 14-day stay. Reservations: None. Details: www.hoodoo.com. grills. Sites: 23 combined (tent or RV). Parking apron size: Can accommodate any size RV. Special Activities: Birdwatching, picnicking. Rates: $14 per day. Maximum 14-day stay. Reservations: None. Details: www.hoodoo.com. Season: Year-round (services June-September 1). Location: On Hwy. 242 west of Sisters. Access: From Sisters, 13.9 miles west on Hwy. 242, then 0.3 miles on F.S. Road 900 (dirt). Elevation: 5,300 feet. Facilities: Vault toilets, tables and grills. 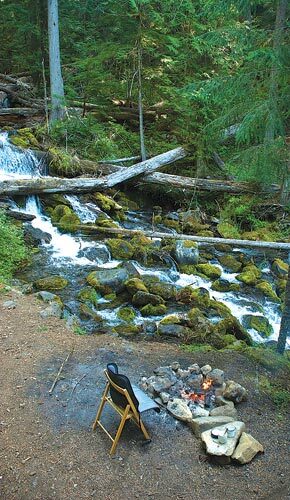 Campground is rough and rocky, providing a wilderness-like camping experience without having to hike in. Sites: 11 tent only. Special Activities: Hiking, horseback riding, non-power boating. Rates: No charge. Reservations: None. Season: May-September (weather permitting). Location: On Suttle Lake, 16 miles west of Sisters. Access: From Sisters, 13.2 miles northwest on Hwy. 20, then 1.5 miles west on F.S. Road 2070. Elevation: 3,500 feet. Facilities: Beach, vault toilets, piped water, tables and fire pits. Sites: 10. Special Activities: Swimming (large beach front), hiking, popular group/family meeting location. Rates: $16 per night. Reservations: National Recreation Reservation Service, 877-444-6777 or www.recreation.gov. Season: May-September. Location: On Suttle Lake, 16 miles west of Sisters. Access: From Sisters, 13.2 miles northwest on Hwy. 20, then 1.5 miles west on F.S. Road 2070. Elevation: 3,500 feet. Facilities: Vault and wheelchair-friendly toilets, piped water, tables and grills. Sites: 7 tent, 31 combined (tent or RV). Average parking apron size: 12x40 feet. Special Activities: Fishing, boating, hiking. Rates: $16 per day single; $30 per day double. Maximum 14-day stay. Reservations: National Recreation Reservation Service, 1-877-444-6777 or www.recreation.gov. Season: June-October (weather permitting). Location: On Three Creek Lake. Access: From Sisters, take Elm Street (becomes Road 16) south 16 miles (last 2.1 miles rough and rocky, not RV friendly). Elevation: 6,500 feet. Facilities: Vault and wheelchair-friendly toilets, tables and grills. Sites: 4 tent, 6 combined (tent or RV). Average parking apron size: 12x38 feet. Special Activities: Fishing, non-power boating (excellent canoeing), hiking. Rates: $14 per day. Maximum 14-day stay. Reservations: None. Details: www.hoodoo.com. Season: April 15-October 15. Location: S. Locust Street, Sisters. Access: From Highway 20, travel south on S. Locust Street 1/4 mile. Elevation: 3,100 feet. Facilities: Toilets / Showers / Dump Station/ Water Spigot/ tables and fire pits. Sites: 25 full hook-up sites, 38 combined (tent or RV) dry sites. Special Activities: Walking distance to downtown shops and restaurants. Rates: $12 per day for tents /$34 per day for RVs (30-amp). (Call for senior rates). Maximum 14-day stay. Reservations: None. Details: www.ci.sisters.or.us/parks.html, Park Host 541-588-0445 or City of Sisters Public Works Dept. 541-323-5220. Note: Camping information is subject to change.